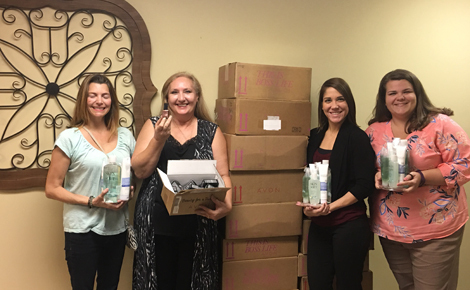 Share33Tweet+1SharePinSandi Wilcox donated all these Avon products to the agency. Pictured left to right: Katherine Denton (former CLSH Board Member), Sandi Wilcox, Nicole Velivis and Jamie Bormann. Thank you Sandi Wilcox for the wonderful donation! A little makeup goes a long way to helping our clients in many ways. 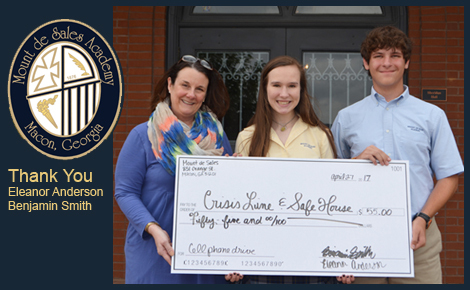 Share9Tweet+1SharePinThese two Mount de Sales students Sophomore Eleanor Anderson and Freshman Benjamin Smith presented Crisis Line & Safe House of Central Georgia Executive Director Dee Simms with a Check after completing a cellphone drive.Thank you Eleanor and Benjamin for you hard work and for your donation.